This book is being advertised as a rival to Dan Brown. 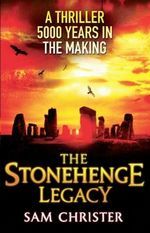 Codes, secret societies and worshippers of ancient Gods in a secret undiscovered place beneath Stonehenge.. But, in reality, it is a police procedural starring Wiltshire D.I. Megan Baker, struggling to hold down the job whilst bringing up her young daughter alone. And that is where the book falls down because the two do not gel together. On one side we have SOCO teams and CID officers dealing with a kidnapping and on the other we are in a world of human sacrifices and crazies. It doesn’t help either that, just by chance, the victim happens to be the daughter of the American Vice President. How far fetched is that? No ransom. She is to be the next human sacrifice. Not to say that this is not a gripping story. It is well told and keeps your attention to the end. It is only when you finish it that you look back and realise how preposterous the whole plot was, including the identity of the cult leader, and you’ll wish you had made better use of your time by taking up Flower Arranging or learning Swahili. On the other hand, it will make a good film. As long as you treat it as no more realistic than Batman. Perhaps for his next book, Sam Christer could stick to the detectives and leave the mumbo jumbo to Harry Potter..